I want to get this mermaid piece finished and I had a free chunk of time today, so I brought it up to the Studio to do a little work. I took a good look at the block for the first time in weeks. Saw no need for additional carving or sawing. 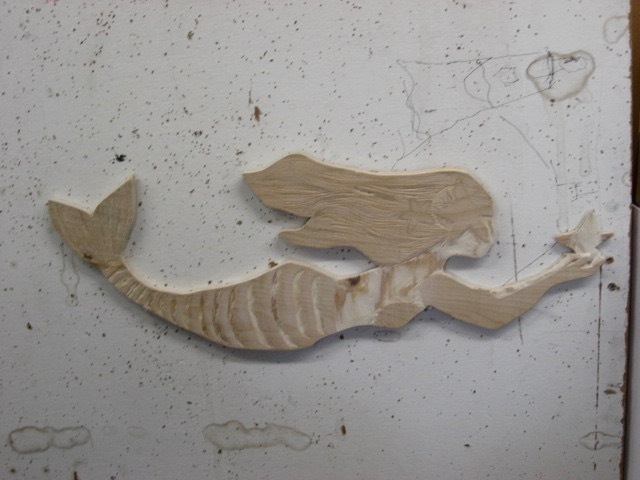 I did erase some of the leftover pencil lines from the original sketch, and did some detail sanding. So it doesn't look that much different than it did, but I think it's ready for the next step. What I'd like to do next is do a rubbing style print of it (or maybe a few) before I add the final colors to it. This is not with a goal of creating a specific woodcut piece, but rather to have it as something I might make use of in the future. Also it could serve as a demo piece for an approach to woodcut that I used to use back in the 1990's, and while it's not what I do now, I could see some students benefiting from the process. I plan to use a very thin Japanese paper (as I did back then) which works well with this process, but sometimes ink can leak through the paper when doing this, which is why I want to do this before I put the final colors on the sculpture. My visit to the Studio today also allowed me to get the answer to something I had been wondering. Last week I had been there twice, picking up and dropping off my wooden studio chair, which I use as a drawing prop for an exercise in negative space for my classes. 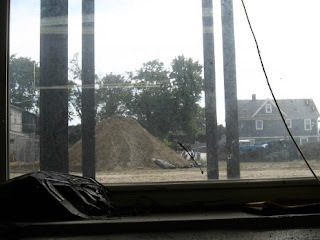 In those brief visits I had noticed a lot of activity in the back parking lot, which had once been the old annex to the original high school, and years ago had been concrete and fenced in and locked with a padlock. (our keys opened it if we needed to get in, either for spare parking, or to bring things in the back door- much closer to my Studio space.) Several years ago all that was torn down and we were left with a dirt lot and a vague plan to pave it to create additional parking. Last week I saw large construction type vehicles and piles of dirt, and today workmen were removing the retaining wall that separates the property from route 71, so obviously something is going down. This is the best view I could get through my Studio window, with dumpsters and other things blocking other directions, but you get the idea. The office was open today, so I asked and got an answer. This is the process of actually finally paving that back lot. The hope is that it will be done by the end of next month. This will be of great benefit to people coming here for events, especially if they have the back doors open. Even if not, walking around the building is easier than walking across town. Keeping those spots free of cars not coming for events and businesses in the building, that's another challenge they'll have to deal with.